The global conveyor systems market is ruled by some prominent players, says Transparency Market Research, on the basis of a recently published report. The competition among the players is notably intense. Most players are focusing on improving durability and quality of the products to stay ahead in the league. Companies are also focusing on reducing production costs to attract higher sales in the coming years. At the same time, organic measures like mergers and acquisitions can also be witnessed in the coming years by some prominent players in the global conveyor systems market. The top players in the global conveyor systems market account for more than 50% of the total shares. The competition is expected to become more intense as regional players will up the ante to increase their shares. Some of the key players in the global conveyor systems market are Murata Machinery Ltd., Daifuku Co. Ltd, Dematic Group, and Schaefer Systems International Inc. The global conveyor systems market was valued at US$4.6 bn in 2016 and is expected to grow at a CAGR of 3.5% during the forecast period from 2017 to 2025. The market is projected to reach US$6.31 bn by 2025. Such positive factors will aide growth in the market in the coming years. 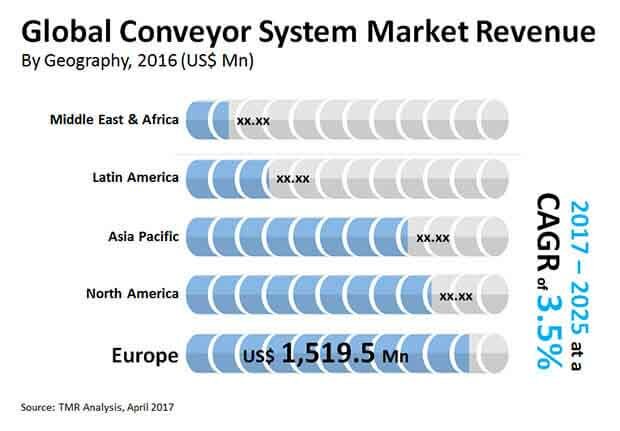 Europe is expected to remain the most dominating region in the global conveyor systems market. At the same time, analysts predict that the Asia Pacific region will grow at a never-like-before pace in the coming years. Among the various types, belt type conveyor systems will hold the highest share in the market. Conveyor systems are used to move products across a manufacturing process. While handling large volumes of goods, laborers might struggle to move them from one place to another. On the other hand, many manufacturing industries handle heavy products. Conveyor systems could be the ideal product to help improve the manufacturing process’ efficiency and speed. It also helps provide safety to the laborers. These aspects are favoring growth in the global conveyor systems market. Another area where conveyor belts find applications is airports. The number of people opting for air travel is increasing year after another. This has pushed governments across the world to expand airports to meet the growing passenger footfall. This also calls for more number of conveyor systems to improve speed of baggage collection for arriving passengers. This is another positive trend for the global conveyor systems market’s expansion. Conveyor systems are expensive. Not only that, their installation is a humungous task for manufacturers. The cost of installation is also expensive. Hence, it is almost impossible for small and medium scale industries to facilitate installing conveyor systems. This could impede growth in the global conveyor systems market. However, many manufacturers have realized that there is enough demand from small and medium scale industries to improve their manufacturing efficiency. To suit their demands, companies in the global conveyor systems market are working on developing small scale conveyor systems that are budget-friendly and easy to operate.